Motor Trend has chosen the Cadillac CTS as its 2008 Car of the Year, attributing the win to sharp styling, great driving dynamics and luxury value — pretty much, the car rocked every category. For the General, it marks the first time in ten years that the company has taken home MT's top award. The Corvette won the Golden Calipers in 1998. Cadillac also has a special place in COTY history: Motor Trend's very first Car of the Year award went to Cadillac in 1949 when the award was given to an entire company, not just a single car. The CTS beat out the Audi A5/S5, Chevrolet Malibu, Dodge Grand Caravan, Honda Accord, Mercedes-Benz C-Class, Scion xB and Volvo V70/XC70 finalists to earn the award. The testing consists of a barrage of track tests and a 28.5-mile road loop to explore everyday driving characteristics. And finally, in a sign that gas prices really are out of control, Texaco has become the official fuel of Motor Trend by supplying all of the gas for COTY testing. Full press release from the General after the jump. DETROIT - The editors at Motor Trend, one of the world's premiere automotive authorities, announced today that they have chosen the Cadillac CTS as the 2008 Motor Trend Car of the Year. "Cadillac is truly honored to receive one of the world's most coveted automotive awards," says Jim Taylor, Cadillac general manager. "This is a very meaningful reward for our team that created the all-new 2008 CTS, and a powerful statement to consumers everywhere about Cadillac's product renaissance." The Motor Trend Car of the Year honor highlights the wide acclaim the 2008 CTS sport sedan has earned around the world and with consumers since its launch earlier this fall. Luxury cars buyers are responding similarly, with CTS U.S. sales jumping 75% in October. The full report from Motor Trend appears in the January issue of the magazine (on newsstands in early-December) and online at www.motortrend.com. Cadillac was the first automaker ever to win Motor Trend Car of the Year in the magazine's inaugural year of 1949, and again in 1952 and 1992. Cadillac (www.cadillac.com) has been a leading luxury automotive brand since 1902. Cadillac's heritage of dramatic design and technical innovation has undergone a recent renaissance, returning it to the top-tier of luxury brands. 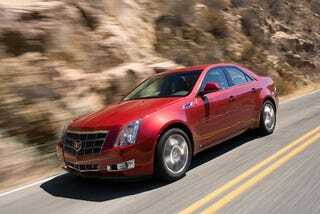 Cadillac is a division of General Motors (NYSE: GM). Founded in 1908, GM manufactures its cars and trucks in 33 countries. In 2006, nearly 9.1 million GM cars and trucks were sold globally. More information on GM can be found at www.gm.com.